Pear and Caramelized Onion Flatbread is SO delicious! 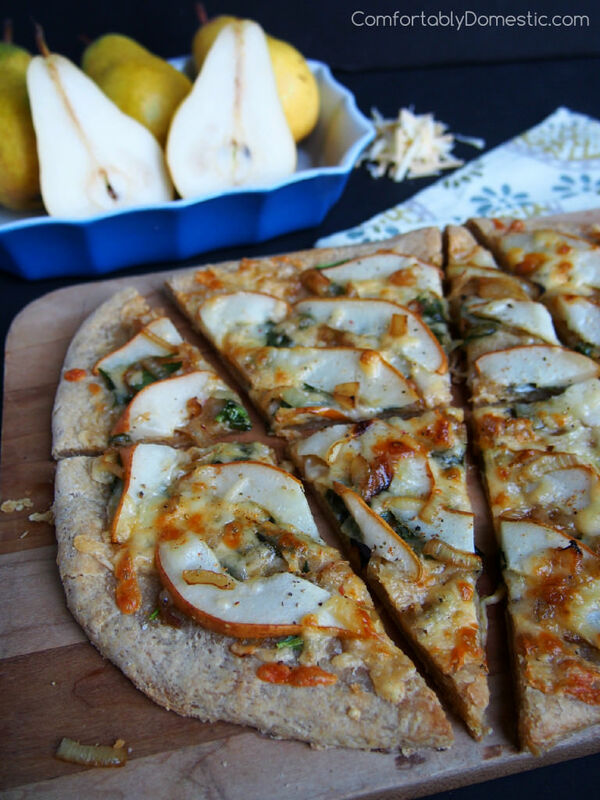 Warm, crispy flatbread, adorned with spinach, tangy caramelized onions, juicy pear slices, and a variety of melted cheeses. Thank you Milk Means More – United Dairy Industry of Michigan sponsoring this Fabulous Flatbread recipe. All opinions are my own. When planning meals, I try to have a balance of protein, grains, and at least one vegetable or fruit represented. I’m pretty sure that when ruled by my own cravings, I would happily subsist on a combination of cheese, fruit, and bread. I mean, cheese is all sorts of healthy with all that great protein. Fruit is the perfect companion to cheese, and what’s a meal without a little bread? An incomplete meal, I say! Flatbreads are a great vehicle to serve a complete balance of tasty stuff in one delicious dish. When my friend Rachel of RachelCooks.com asked me to join in the Fabulous Flatbread Challenge, I knew that my flatbread would include what I consider to be the trifecta of a balanced diet: cheese, fruit, and bread! Thus, my Pear and Caramelized Onion Flatbread was born. Before I get to the recipe, I should probably mention that not only is Rachel inviting a few blogging friends to participate in the Fabulous Flatbread Challenge sponsored by United Dairy Industry of Michigan, but she’s inviting YOU to join in at Rachel Cooks — YOU can win great prizes, INCLUDING A KITCHEN AID STAND MIXER! We’re talking about exciting, high end type prizes! More about that after the recipe…first, let’s talk about this fabulous pear and caramelized onion flatbread. Pear and Caramelized Onion Flatbread is a crispy, baked whole wheat flatbread that’s layered with ripe, juicy pears, savory caramelized onions, tender baby spinach, and creamy Gouda and Asiago cheeses. This flatbread is so good, Friends! I chose a super simple 30 minute whole wheat pizza dough as a base, but hey! If you’d want to save time and use a prepared pizza dough, then you’re secret is safe with me! The peppery caramelized onions compliment the sweet pears so well, and all that melted cheese ties everything together beautifully. My always-hungry-never-full-teenaged Son #1 walked though the kitchen and snagged a slice fresh out of the oven. The kid didn’t even miss a step! About 3.5 seconds later, he trotted back into the kitchen and asked, “Can I have another piece of…of…whatever that awesomeness was? It’s like the perfect food!” That, my friends, is high praise. After you try the Pear and Caramelized Onion Flatbread that Son #1 doth proclaimed to be the perfect food, head on over to Rachel Cooks to read all the details of the challenge, find out what great prizes are up for grabs, and then link up your fabulous flatbread recipe. 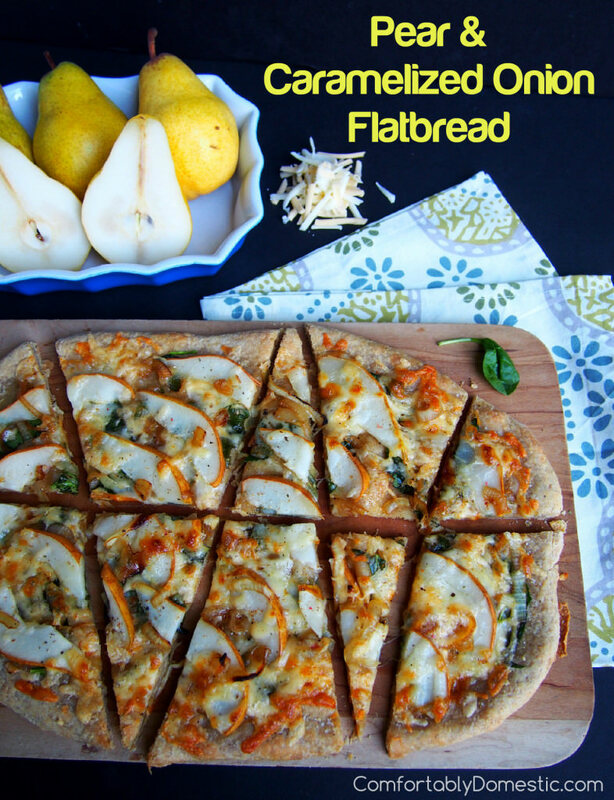 Warm, crispy flatbread adorned with spinach, tangy caramelized onions, juicy pear slices, and a variety of melted cheeses. Preheat the oven to 200 degrees F. Once the oven reaches 200 degrees F, set a timer for 10 minutes. Measure the bread and whole wheat flours along with the kosher salt, placing them into a large bowl of a stand mixer that is fitted with a dough hook. Briefly stir to combine. Turn the mixer on to a medium-low setting, and then gradually pour the yeast and oil mixture into the flour. Once all the liquid has been added, increase the mixer speed to medium, and allow it to mix the dough for one minute. The dough will be sticky, but not too gooey. Pour a little blob (about 1 teaspoon) of olive oil into a large, oven safe bowl. Take the dough from the mixing bowl, and roll it into the shape of a ball. Put the dough ball into the oiled mixing bowl. Swirl the dough around in the oil, turning it over to coat the dough completely. By now, the oven should have been heated to 200 degrees, for 10 minutes. Turn off the oven. Cover the bowl of dough tightly with plastic wrap. Place the bowl in the warm oven, and close the door. (Verify that the oven is turned OFF.) Allow dough to rise in the warm oven for 30 minutes, or until dough has doubled in bulk. While the dough is rising, prepare the caramelized onions. Place a 10-inch skillet over medium-low heat, allowing pan time to warm. Melt the butter before adding the onions, salt, and pepper. Cook the onions over medium-low heat, stirring periodically, until onions are deep golden brown, and very tender; about 15 minutes total. Once the onions are caramelized, gather the remaining toppings. By this time, the dough should have risen and be ready to use. Preheat the oven to 450 degrees F. Place a large pizza stone (if one is available) or a large baking sheet in the oven as it heats. Roll (or stretch by hand) the dough out on a floured surface to an even 1/4-inch thickness. Carefully transfer the flatbread dough from the work surface to the hot pizza stone (or baking sheet) in the oven. Par bake the flatbread for 3 minutes. Remove the flatbread from the oven. Brush the olive oil over the dough, within ¼-inch of the perimeter. 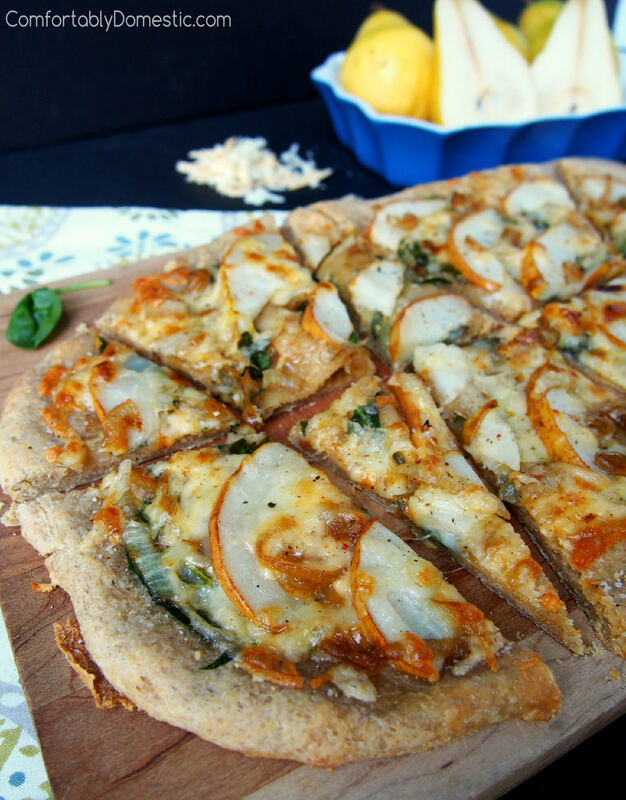 Layer the spinach, ¼ C. of the caramelized onions, sliced pears, and shredded cheeses over the dough. Sprinkle with salt and the pinch of cayenne pepper. Bake for 8 to 10 minutes or until the flatbread is golden and the cheeses are melted. Crack the black pepper over top immediately prior to serving. YES! YES! YES! YES! I love caramelized onions and pears. You don't have to tell me twice. I would gladly go Pac Man on this! Bwahaha! Great visual of Going Pac Man! I'd like to request you make this before we meet, then bring it with you. Screw eating out. let's have a picnic. With this flatbread. Dude. We should totally picnic while we shop! We could even "try out" potential blog props along the way. Genius. I LOVE the idea of pears of an flat bread! Nice! The pears are so wonderful with all of that cheese! pears and caramelized onions? sounds like heaven on a flat bread! I love the savory and sweet combo here, looks fabulous! 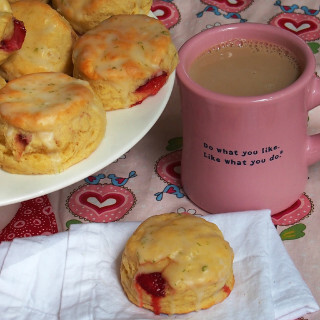 The savory is really the more prevalent, with just enough sweet to make it interesting. Oh my goodness -- what an awesome combination! Love, love, love pears with caramelized onions. I am loving this flatbread challenge. I think your caramelized onion and pear is The Best! You had me at caramelized onions. Swoon. They're so awesome on everything. I adore this recipe and can relate to the perfect meal of cheese, fruit and bread. I need a good recipe for flat bread and now I've found it! Hooray! Another Sister in Food! Flatbread, cheese & pears? You bet I'm in! Amazing, Kirsten. Thanks, Sister! You'd really love this one. P.S. The toppings would be *awesome* on that homemade Naan of yours! My boys would absolutely love this! The onions and the pears are a great combo! Surprisingly, ALL of my boys devoured this flatbread. Half of them don't even eat pears! 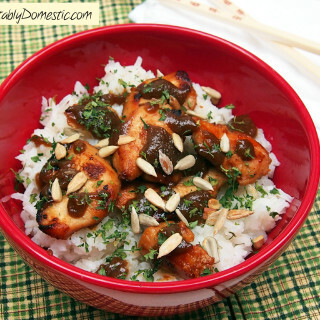 I am so going to make this...it sounds delicious! You always know the way to a good meal! Thanks for so many great recipes! You're welcome! Thanks for always being such a willing taste tester. I really think that you'll like this one. Oh yes! I could totally live on bread, cheese, and fruit (especially in the form of wine), too. Your flatbread definitely looks like the perfect food. I like the way you think, Sister! I wanted to participate in this, but just couldn't fit it in :/ I love what you made. Yes, to all of that! Wah! I wish you could have joined in, Amy! I'm sure that your flatbread would have been awesome. Caramelized onions pretty much go well with everything. This flatbread looks out of this world! I love the idea of sweet pear mixed with the savory onions. I want! That combination with all the creamy Gouda really knocks the flavor out of the park. OhmyGAWSH I'm gonna need to be alone with a plate full of this. Mama! YUM! Dude. You totally will need a little quality time with this flatbread. You will not want to share! Pears and caramelized onions are two of my favorite things! This looks amazing. Thanks for helping me kick off #FabulousFlatbread!